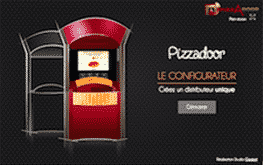 PIZZADOOR distributor allows benefits from a big capacity cold room authorizing the storage and the management in automatic of 70 fresh pizzas, home-made prepared. The distributor identifies the date and the hour of pizza entrance to cold room and manages the expiration dates on a base of 72 hours. The management is automatically made in FIFO, the first pizza entered in the cold room, will be the first one to be served to the customer. Beyond the deadlines of expiration date, pizzas cannot be distributed will be blocked in sales, in according to the legislation on the food safety. The high-performance with pulsed warm air oven allows a cooking of browned and crunchy pizzas within a very short time (less than 3 minutes). Cooking deeply and uniformly beyond 63 °C pizzas furnished generously with a 700 gram middleweight. This technology avoids the employment of quartz (used especially to reheat and not to cook), fatal in food safety in case of explosion of a lamp. The cooking results is similar to the traditional catering. Cardboard employed for pizzas boxes are under food quality and has 36 mm height and 29 cm diameter. These boxes authorized the most generously furnished pizzas available on the market in a vending machine. The automatism of the distributor uses noble food materials as stainless steel. Guaranteeing a perfect hygiene and easy for cleaning. Sensors, connected by internet with the ADIAL server, guarantee an optimal use by sending warning messages if an incident arises in the course of operation. Remotely, operating staff and ADIAL employees are warned and can, in 99% of cases, resolve the incident without moving to the distributor. An attractive design associated with a 71 cm screen gives a natural interest to customer for the PIZZADOOR distributor. Clear, visible from far away, the screen allows to presents a set of pizzas menu by integrating pictures of various garnishes pizzas. The graphics of the screen emphasized with videos and photos, the work of the pizzaïolo.